A wonderful time was had by all at the Grapehounds Virginia event. This was the first event of its kind in the area and we all are hoping that it will become a regular event. It was a lot of fun for people and hounds alike. For a first time event, it was very crowded and it ran perfectly! Thanks to Larry Bowersox for organizing the event and for having everything so well planned. The weather was perfect and we heard no complaints from anyone! Our group vended and we did very well, much better than expected. 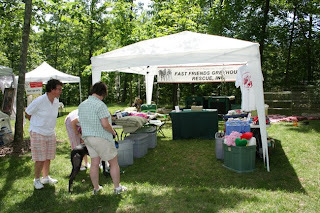 We saw lots and lots of our adopters and dogs. Thanks to all of the volunteers who came and helped out during the day. It made the entire day very easy because so many people pitched in to help. It was one of the easiest events we’ve ever done because of all the willing hands. Let’s hope we can mark our calendars for next year!~!! !